Halloween 2018 is here. Let’s celebrate it with joy as we are giving out 30% discount on all our premium themes. Yes, Halloween is here. This spooky and fun international festival which falls on October 31st each year is celebrated widely throughout the world. To make it better we are offering a 30% discount on all of our premium themes. Generally, people celebrate this famous festival Halloween widely among many countries on the day of October 31st. They decorate their house, shops, offices and many other places with interesting decorations around the house, shops, and offices. As this festival is related to ghosts, spirits and creepy people so people decorate themselves as ghosts to look scary. People particularly young ones prepare big plans for this day in advance. They choose which costume to wear and select their favorite horror figure. Some of the famous dreadful figures include vampires, monsters, ghosts, skeletons, witches, and devils. Children wearing their respective Halloween costumes along with makeups, face painted and masked visit house to house to ask for a treat, candy, money etc. Some of them even play pranks and share ghosts stories. They have a huge Halloween costume party where everyone dressed up in their costumes dance and enjoy the whole night. The famous carving pumpkins into jack-o’-lanterns is well-known where a full-size pumpkin is carved out of the rind with usually a monstrous or comical face to expose the hollow interior. To create the lantern effect, a light source is placed within before the lid is closed. The light source is traditionally a flame such as a candle or tea light. It is known as the symbol of Halloween and is said to represent the souls of the dead. Lastly, let’s celebrate this year’s Halloween significantly with rejoice with our special offer. 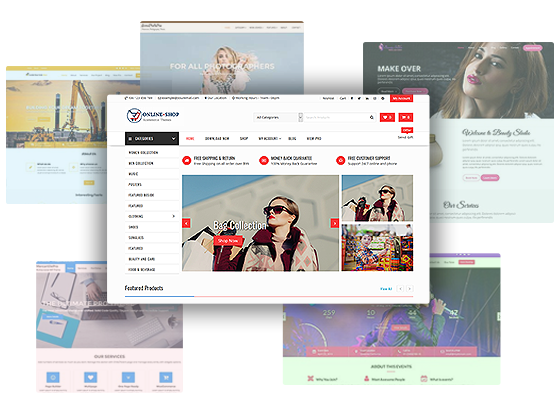 We provide you with a 30% discount on all of our premium themes.